In a discussion of China's four regional cuisines (North, South, East, and West) the provinces of Szechuan, Yunnan, and Hunan are combined to represent China's western regional schools of cooking. It's true that Hunan and Szechuan cuisine have much in common -- both are famous for their fiery cooking and production of rice. But there are also significant differences. Geographical Influences in Hunan Cuisine: "The Land of Rice and Fishes"
Szechuan is a mountain-ringed area with steep cliffs. The most fertile region area lies outside the capital city of Chengdu, in the eastern basin known as the Red Basin. By contrast, Hunan is a land of gentle hills, capable of producing a great deal of food. The northeastern section of Hunan falls in the Middle Yangtze Plain, a fertile agricultural area. China’s second largest Lake, Dongting Lake, is located in the far northeast portion of Hunan province. Elaborate preparation is a hallmark of Hunan cuisine. Orange Beef, made by marinating beef overnight, then marinating again with a mixture including egg white, wine, and white pepper, is a classic Hunan dish. 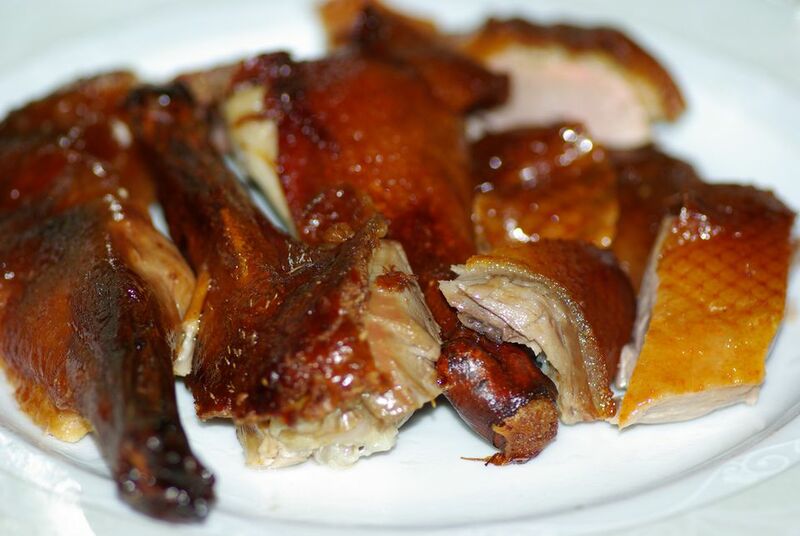 So is Crispy Duck, made with duck that is seasoned with peppercorns, star anise, fennel, and other spices, then steamed and finally deep-fried. Hunan cooks spend more time on the appearance of a dish than their Szechuan counterparts. While famous Szechuan dishes such as MaPo Dofu and Twice Cooked Pork are very nutritious, they are not as "pretty" as some of the dishes featured in other regional cuisines. Both Hunan and Szechuan cuisine makes extensive use of chiles, to cleanse the palate and to cope with the humid climate. (Hot foods such as red chili peppers dry out and cool down the body, making it easier to handle the heat and dampness). However, while Szechuan recipes frequently call for chili bean paste, Hunan dishes are normally made with fresh chile peppers, including the seeds and membranes which contain most of the heat. Chili peppers, shallots, and garlic. Rice is the staple grain - Hunan produces rice in higher quantities than any other province in China. Poultry and meat dishes are also popular - Hunan is China's second largest supplier of beef, pork, and mutton. Hunan's lakes provide an abundance of fish and shellfish, as well as more exotic food such as turtle. "Sweet and sour," "hot and sour" and "hot and spicy" are popular flavor combinations in Hunan cooking. When it comes to smoked and preserved meats, Hunan cooking displays the influence of both its western neighbors. Recipes featuring smoked meat are found in both Hunan and Szechuan cuisine and the preserved pork products that have made Yunnan famous are widely available here as well. Simmering, steaming, stewing and frying are all popular Hunan cooking techniques. Hunan's culinary repertoire consists of more than 4,000 dishes, including Dong'an chicken, crispy duck, orange beef, and spicy frog's legs. Hunan is the birthplace of Mao Zeodong, leader of the National People's Republic of China.